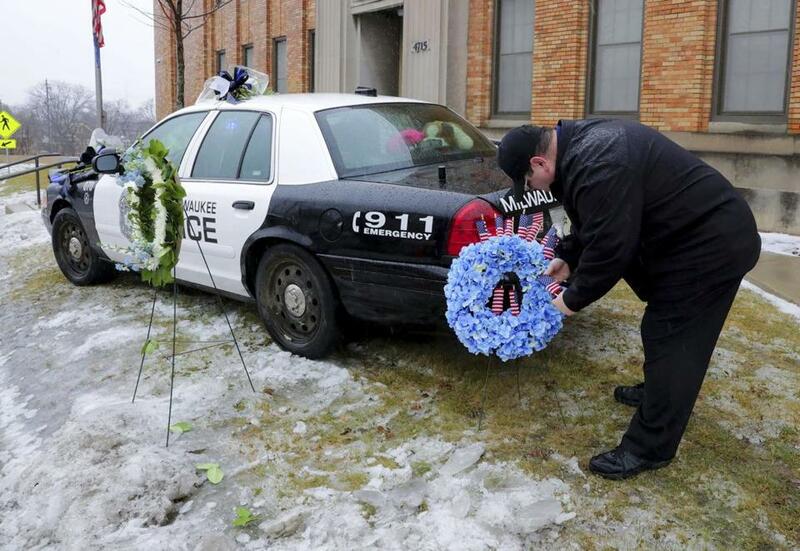 Timothy Nelson, of Oak Creek, Wis., placed small flags in a bouquet near a police car adorned with flowers as a memorial for fallen Milwaukee Officer Matthew Rittner at the Neighborhood Task Force police building in Milwaukee on Thursday, Feb. 7. According to the criminal complaint, police announced their presence several times and said they had a search warrant, and an officer yelled ‘‘police’’ right before Fricke fired four rounds through a hole in the door that Rittner had made with a battering ram. Rittner died of a gunshot wound to the chest. Fricke was in bed with his girlfriend when they were awakened by loud noise and yelling. He told investigators that he never heard anyone yell ‘‘search warrant.’’ He said he thought he heard someone say ‘‘police’’ but didn’t think it was actually the police trying to break into his home, the complaint states. Rittner’s funeral is scheduled for Wednesday at Oak Creek Assembly of God Church in Oak Creek, Wis.